“My Supima capsule collection is called “The Aureate” meaning: gilded in gold. It tells the story of an angel that has fallen to earth,” said Duston Jasso of the Fashion Institute of Design and Merchandising describing his collection for the Supima Design Competition. 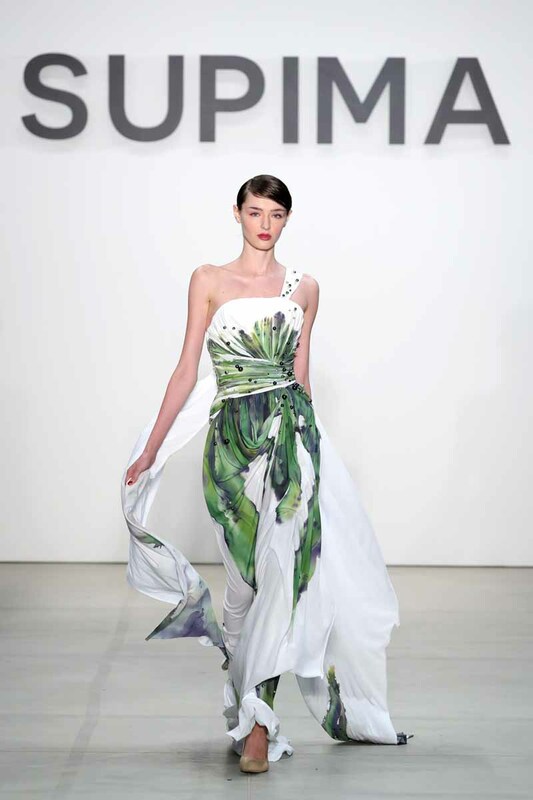 A collective runway showing of participating designers from the nation’s top design schools, the ninth annual Supima Design Competition Runway Show was held on September 8, 2016 at the Skylight Clarkson Sq during the first day of New York Fashion Week. Recent graduates from the nation’s top leading design schools: Duston Jasso from Fashion Institute of Design and Merchandising, Jiyeon Lee from Fashion Institute of Technology, Kara Michelle Kroeger from Kent State University, Jacqueline Zeyi Chen from Parsons School of Design, Jacob Blau from Rhode Island School of Design, Jeffrey Taylor from Savannah College of Art and Design – presented capsule collections of women’s eveningwear made exclusively with donated Supima cotton fabrics from the organization’s partners including AG Jeans, Brooks Brothers and Uniqlo. Started in 2008, the annual Supima Design Competition was created to give runway exposure to emerging talent and was modeled on the legendary 1954 Wool Secretariat competition that launched the careers of the then-teenaged Yves St. Laurent and Karl Lagerfeld. Since its start, former Supima Design Competition winners have gone on to launch their own labels, show at New York Fashion Week, and secure jobs with top international labels including Michael Kors, Marchesa, Ralph Lauren and Phillip Lim.